“Master,” a voice called out from within the darkness. The place was hardly visible, just a few light outlines of objects, some stationary, others not. This outline, small and frail, held a voice that was hesitant; his high pitched tempo along with the occasional yelp dissolved the dark and dreary atmosphere. Another outline, this one much bigger in comparison to the smaller outline, turned his body and grunted to show he was listening. “M-master,” the small man stuttered. “The preparations are almost c-complete. The blood has been collected a-and the bodies have been placed the way you asked.” He was out of breathe now, speaking very rapidly and with short breathe in the middle of every interval. Although not visible at first, if someone had turned on a light then, one would see the man’s pale and clammy face, drenched in sweat. “Thank you Inu. Your work is much appreciated.” The bigger man’s voice was more controlled. The sentence swept across the room like a horde of bee’s, in one silky motion. Just from words alone one could tell the tremendous power he held. Inu, though complimented, still shuddered from the sound of his name being uttered from the mouth of his master. Inu stumbled to get up, scrambling to the door. “Let me take out these worm’s master, they are not worth your time,” he hissed. Although the place was pitch black, the sound of the master’s hand clapping together layered the place with even more darkness, like he was the only living thing there. Inu, whimpering left the quarters, praying he wouldn’t have to clean up the remains. The wind blew in their hair. But the sweat on their forehead would make you think that they were off to war. In a way, they were off to worse. “A suicide mission,” the Hokage had told them. They knew the terms and the dangers, but they still accepted the mission. This wasn’t for them anymore, it was for what they cared for; although they probably won’t see their loved ones ever again. The man in front of the formation, Takashi, let out a signal, and the other three dispersed. Two hid behind two trees, the others disappeared. Takashi, still in the open, stopped. He held his head high and whipped out something from his back pocket. A shuriken flew purposely in between two trees, but just as it passed the thick of its trunk, the shuriken dissolved. All the remained was a pile of sand on the ground. “Impressive,” a voice called out. Takashi swerved around, but no one was there. He turned back, still no one. He tensed, and slowly looked up. There, he saw a man amongst men. The opponent was shrouded in a white cloak, but Takashi saw the dark clothe underneath. “Who are you,” Takashi asked. Behind his back, he made another sign, a slower one, and a sign of caution. Takashi gritted his teeth. To the people in his village, the man before him was known as the devil’s spawn. The rumors’ spread well; how that man would bleed out his enemies slowly, torture them to near death, but not by using a single ounce of ninjutsu. He was crude and effective, which is why he was to be brought to his knees today. Takashi threw another shuriken at “The Knight,” but the image just shimmered. A voice spoke out, but not from the hologram. Takashi’s heart stopped as he turned around. Behind him lay the bodies of his comrades piled up, and the killer stood much too close to the pile. He looked just like the hologram, but Takashi could feel the evil emanating from his body. It was a strong stench he couldn’t let go. Takashi looked at the monster, lowered himself, and looked him right in the eye. -Please comment and critique on what you read. I apologize for the length, it wouldn’t have made much sense if I cut it of earlier. -I’m not sure if I want to continue this Fanfic, but tell me if you think I should, and what I should improve on. The black flames licked the land so vigorously. The rain fell from teh sky but had no effect on the fire from hell. Blood was spilled over the once beautiful land. Acres of land lay in ruins as the ground caves in and rises out of the ordinary. The dissembled bodies are scattered over the ground. Their heads separated from their bodies. Agonizing screams fill the air, and then an eerie silence replace it. Naruto stands amongst the horror. His eyes not believing what he see’s before him. His body paralyzed with fear and anger, but much more stops him. Swords of the samurais lay broken. One warrior approaches him. “Help me…” he says as a sword pierces his heart. He looks down at the body, as blood spills calmly from his wound. Naruto looks up to see the devils eye looking back up at him. “Just die,” the man whispers as he brings the sword down at his new target. Naruto wakes up from his nightmare. Naruto (to himself): Woah…I’ve been having this same nightmare lately. I should just go to sleep. Kakashi: Naruto, you wanted to ask me something? Kakashi: About the Kage summit? Kakashi: I figured as much, maybe somethign is about to happen, but everyone knows that. Anbu: Hokage-sama has requested you to his office. Shikimaru: There’s been some commotion near that bridge named after Naruto in the Land of waves. I want you to go and see what this is about. Stop the commotion and use force if necessary. Understand? Naruto and Kakashi: Yes sir. In about two hours Naruto and Kakashi set off to their destination. Naruto: What do you think this is about? Kakashi: Probably something to do with the upcoming battles. Stay on your guard. At the Land of Waves, it is raining heavily as they see the aftermath of one of these so called “commotions” although it was much more than just that. Surrounding him was corpses or the dead mangled and annihilated. The blood was sprayed everywhere, but it wasn’t red, it was black. Weapons lay everywhere and most of them were inside of people. The two Konoha ninja’s looked around and Kakashi picked up the skull of an infant. His eyes were closed but Naruto’s was wide open with anger. He was silent, but it was all out of rage. They walked ahead some more towards the bridge when they saw that it was completely torn. only a little on each end lay. More bodies of people lay broken. Just then a hooded man begins to speak. Person: Oh, the people of the villages did this don’t you know? Naruto: No…These people aren’t that cold hearted to kill people and leave their bodies behind. Person: They were very well willing to, that is, if they were convinced. Naruto: ….What are you talking about? Naruto: But this isn’t greed, it’s just plain destruction!!! Person: But what about the greed of power? The want to control over everything you see. That is what took over these people, all they needed was a little..incentive..
Naruto (whispering): You found out who it is yet? The hooded man disappears from sight and reappears in front of Naruto with Zanbatou held at Naruto’s neck. 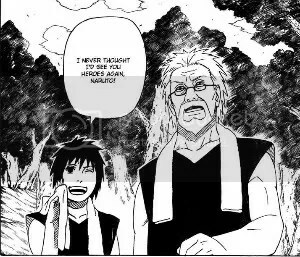 Naruto: So it was you Suigetsu, i should have guessed. Why did you do this? Suigetsu: Oh it was just for some fun. Havoc is tasty dont you know. Suigetsu swings his sword at Naruto but Naruto disappears. All of a sudden Suigetsu gets cut on his cheek, then his forhead, arm, legs, and numerous places. From thin air Naruto reappears. Suigetsu: What the hell was that? Suigetsu: I suppose it allows you to blend into the surrounding air making it look like your invisible but instead its just a “coat” around you to keep your from visible. In other words a camouflage…But this one uses wind manipulation to cut anyone you touch. Naruto: Bravo, You’ve become quite the smart one, but enough talking. Naruto: Kakashi sensei, do you see him? Kakashi: Yes, he’s about 20 steps right of you. Naruto takes out a scroll from his pocket and summons up a Katana. From the Katana a loud sound erupts and an image of Suigetsu falls. But it just turns into a puddle, a water clone. Suigetsu: You’ll have to do better than that. Naruto: Kakashi sensei, cover me. Kakashi: Alright Earth style: Spiked dome. Suigetsu’s body began to mold into the Earth, starting at his feet. but, quickly, he took his sword and broke it. The dome filled with shards and aimed for kakashi. Kakashi: You were already in my genjutsu once you took shape from that puddle. Kakashi breaks Suigetsu from the genjutsu. Kakashi: it seems like Naruto is ready. Suigetsu looks and sees Naruto in sage mode. The dome begins to crumble. Suigetsu slashes his sword and a thousand slashes of water follow. Suigetsu: hm…i guess chakra moves wont work. Both ninja’s clashed with their swords and fought for a while. It was an even match. Naruto: Hmph, its an even fight really. Just then Naruto’s Katana blew up and shards of metal flew all over the place. All of a sudden a wind blew from the southern direction. Everyone stopped fighting and looked. Suigetsu: Crap, i guess its my time to go. Nice playing with you. But Suigetsu leaves without a trace, everything falls silent and the two ninja’s decide to go see their old friends. Its been 10 years since the attack on the summit in the Land of Iron. The Akatsuki managed to wipe the mountain formation off the face of the Earth. Team Hawk played a role in the invasion. That same day, three of the 5 kages were killed: Hokage, Mizukage, and Kazekage. The memories of the black flames still burns in the memories of those who witnessed the invasion. It haunts everyone endlessly. The entire world was put in chaos with their leaders gone. Brother betrayed brother. The economy failed greatly and people lived in garbage cans. the Akatsuki seemed to rule the world, destroying everything in their sights. However; 5 years ago naruto, Yamato, Kakashi, Sakura, Sai, Killerbee, and Shikimaru Managed to kill Madara Uchiha, Zetsu, and Kisame. the entire team Hawk escaped their doom. Now, the villages are weak, tired, and distraught. Many leaders curropt and the world put into a state of panic. Pacts were destroyed and villages put against each other. Three villages stayed loyal to eahc other: Konoha, Sunagakure, and Kumogakure. All thanks to their leaders: Shikimaru, Temari, and Killerbee. But the other villages hate the three supreme villages. their minds filled with thoughts that they were less stable and going through so much more pain. the Tensions of a new war lurked amongst the people. Shikimaru: The Kazekage, Raikage, and I fear a war is coming. I believe we should prepare, gather up our ninja ranks and prepare for war. But, we should also wait to see what the opponent does. We wait for the moves to be played, analyze, and they strike. What do you guys think? Shikimaru is in the Hokage’s office with three other figures. Figure 1: I agree Lord Hokage. We should ready our troops for war and win it. Figure 2: shouldn’t we try and make a pact with them, there is still time to stop this war. Figure 1: don’t be foolish. the pacts were other a long time ago at the end of peace. We can’t afford to waste time, we must use force. Figure 2: War is hell. The people are already going through torture and i don’t want to make it worse. Figure 1: by ending this war we could end the term of pain and horror. Figure 3: This war is inevitable. Whether i like it or not we have to participate. It will be two main sides: the three supreme and everyone else. This all started because of our stability over the others. They were corrupt, painful, neglected, and times were harsh. The cycle of hate will always continue until it eats itself away. We have nothing left to do. I don’t want to fight, but i cant watch my people die. I will use force if i have to in order to stp this madness.We should wait and see the response of the sides but we should be prepared and ready the troops. the third Hokage made a mistake in try to avoid the unavoidable. Trust are easily broken now a days. But, we need to aim at the source, the leader of the enemy. I want a quick end. Shikimaru: Alright Naruto, Tsunadae, and Kakashi, we have all agreed. I will go as planned. A man is perched on the highest mountain of the land. Behind him a fire burned brightly but that was the only light. The water drizzled from the heavens. He held up his hand, his eyes closed, and spoke to his followers. the People yelled in agreement. Man: it is time for the world to feel our hatred. He opened his eyes to reveal the devil, power, and horror beyond belief. his people look up at him and they tremble at that might, the might of the Sharingan. This is a new Fanfic, i left teh old one. The lack of picture is because 1) too lazy 2) I want you to rate the story (from 1 to 10) and if i get good ratings ill continue, i’ll add pics on the next one. Naruto: Of course, Kakashi is always reliable. So how’s Sasuke doing? Sakura: Much better than before, he settled and started teaching the kids. We’re going to stay near the border if there’s any need for us. Sakura: Don’t let your guard down Baka, so how’s Hinata? Naruto: She’s doing fine, still mad that I get so worked up on the Hokage business, but she’s cooling down. Hiruzen is doing great, improving greatly too! BOOOOOOM A loud explosion occurred outside not too far away near the border. A startled Naruto wonders over what just happened. Sakura: Naruto, there’s been an explosion near the border and approximately 70 ninjas came in. Some of our own Jonin and Chunin are fighting them off but it’s not enough. Naruto: Send the Black Ops and every other ninjas above Chunin level there, were under an attack! Naruto looks out of his window as he views the deployed ninjas go. Naruto: Tajuu kage bunshin no jutsu. I’m going to need to give them some back up. Naruto summons 100 shadow clones and quickly divides them to the attack. After a few minutes he learns that the ninjas attacking are from some unknown village without a forehead protector. One of the shadow clones notices Sasuke as well as Kakashi fighting a large number of shinobi. Another clone realizes that some of the fallen are Konoha ninja. Sakura: I already sent them there. Should we evacuate everyone? Naruto: Not yet, I’ll see if it’s really needed. After a few minutes Naruto realizes that even more enemy ninjas arrive and the Konoha ninjas are having a rough time. Naruto: Did you send the roots to the battleground? Sakura: Is that really needed? Naruto (to himself): This is getting out of hand; I have to put this to an end. Tsunade: Going to go fight? Naruto: *chuckles* Don’t worry, I won’t. With that he left to go to the battle grounds. On the battle ground Naruto heard an odd call. 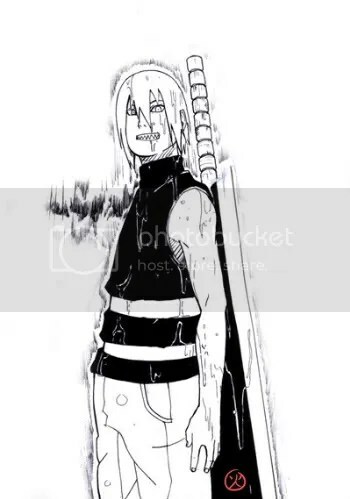 Naruto turns around to see a man behind him, and blood was all around him with a kunai in his back. Naruto quickly takes out the kunai from his back and calls over a medic ninja. Naruto: I will make you regret what you just did to Sasuke, I swear on my soul.